Services available in the field of dentistry have now reached, at least for the most advanced and modern societies, a medium to high degree of quality. It can therefore be said in this context , that the much renowned “globalization” has had a positive influence on this particular field of medicine, (full of social implications), now available to a substantial number of people. The range and diversity of the types of patients who come in for a dental consultation should be the starting point on which to set the course of treatment. It is essential that the focus of this “microcosm” revolve around the patient, as a person. To address these issues, a modern quality dentistry approach must be set up in an organization that offers multiple specialities. Our dental studio was founded precisely with this philosophy and our efforts are aimed to offer total quality dentistry. These super specializations must however completely interact, otherwise you may risk undertaking therapies and treatments that are incongruous and unsuitable for specific conditions. Over-treatment must absolutely be avoided and even more so: wrong treatment. The answer that we identified as a solution to solving these problems lies in the concept of the “dental team“, who can guide us in everyday work. The team can make us aware that our professional individuality is shaped more on a specific educational background and on “ars medica” concepts and skills. On this basis, the services and benefits provided should target the achievement of the optimum result. This can be achieved with a view that goes back to being closer to the expectations of individual patients. Offering quality therapies are the result of a few but fundamental aspects. These include training, research and development, technological innovation, and the organization of the workplace environment. Professional enrichment also means the possibility for us to have the tools that are increasingly modern and technologically advanced. Examples include the operating microscope, the CT (Cone Beam Technology, CBTC) and the 3D planning software of implant surgery. These are all outstanding diagnostic tools that enable us to proceed with more precise, safe and reliable treatment. Even in Endodontics, the CT does play an extremely useful role in the diagnostic field. Very often with traditional radiography, apical lesions (granulomas) are not clearly shown. They are however easily noticeable with computed tomography images. 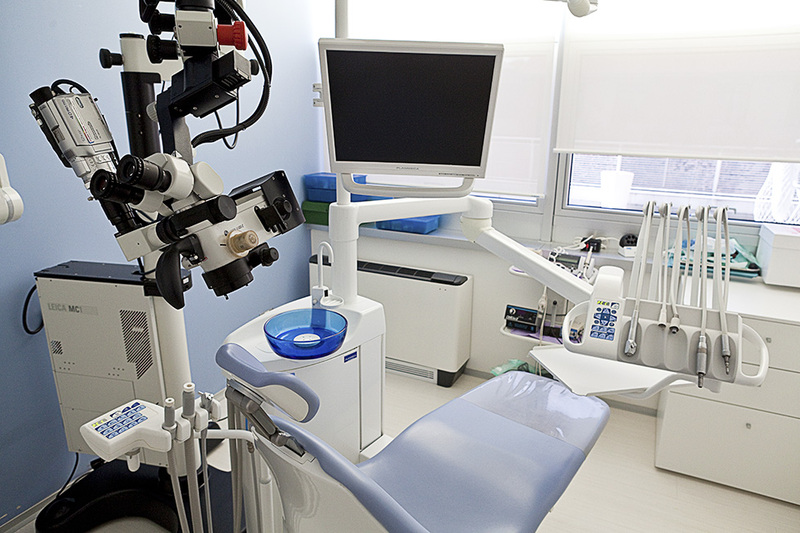 In effect, after the introduction of the Operating Microscope, (which has been used for years in our studio as an essential tool for quality Endodontics), it can be stated that Cone Beam technology is changing the way we deal with many different endodontic problems. It provides valuable information to the specialist, who until now has not been able to receive these diagnostic tools at his disposal in a satisfactory and complete way. It must be emphasized that the emissions of radiation from this equipment are much lower than when compared to conventional tomographs. The high expectations of patients is what leads the dentist-dental technician team to obtain increasingly satisfying functional and aesthetic results. Aesthetic-functional restorations are in fact increasingly more requested by our patients, and in order to achieve the best results these therapies are addressed by following modern diagnostic and therapeutic protocols. The development of ceramic crowns, and the introduction of technology CAD / CAM in the production of prosthetic components, has led to significant improvements in biological, aesthetic and functional areas. All this translates to: an aesthetic that seems more natural and to minimally invasive therapies for the patient that only involve a minor biological sacrifice. The other key point that sets us apart in terms of total quality is that the structure of the studio is closely linked to valuing and using human resources. The entire staff, from our dental professionals to our administrative/clinical employees attend courses in communication and management. Our motivation lies in our intention to minimize the “psychological” distance too often perceived between a patient and the medical staff. Another strategic factor in terms of organization is a collaboration with the dental technician, especially regarding treatments of aesthetic prosthesis. The knowledge and use of new ceramic materials such as zirconia or glass ceramics, their correct indications, the quality of the manufactured “finishing”, the extreme attention to detail and the patient selection are the main aspects of these treatments. Rehabilitations with veneers and ceramic crowns are proposed in our studio. These always follow rigid treatment protocol. We must take into account that in addition to having a big impact in the aesthetics of the patient, they also have a significant functional value. We give significant importance to the area of dental hygiene therefore we employ degree certified hygienists. They are qualified to promote and practice prophylaxis options, as well as perform whitening treatments with the most modern techniques available today. In special cases, we collaborate with an expert anaesthesiologist who becomes a useful aid in cases of complex treatments that require prolonged anaesthesia. This leads to a significant improvement in patient compliance and well-being. Another area with an important social impact is pedodontics. Caring for children of different age groups is also practiced with the help of sedation. This provides the best setting in order to carry out therapy. From what has been shown so far it is evident our belief is in the idea of ​​the team approach as an advantage towards quality dentistry. The collaboration of the various figures within the team is, in our view, the best strategy for optimizing performance levels based on human and professional skills. These skills implemented synergistically on daily basis produce the best outcome.